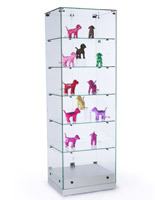 Rectangular tower display cases like these are ideal for any retail store. These showcases will to put a special spotlight on goods while protecting them from wandering hands. 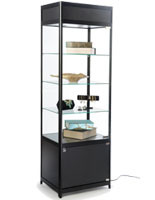 Each rectangular tower display case have a locking design that secures items from theft and tampering. 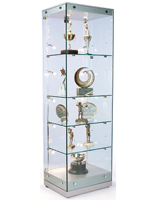 These trophy cabinets help provide extra selling space on any sales floor. They each have a slim design measuring 20" to 24" wide. 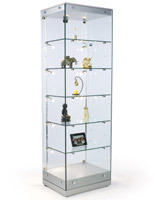 Some models come with halogen lighting that illuminate merchandise and curios from the top or sides. These lights use halogen bulbs and can create custom shadow effects. In addition, some rectangular tower display cases have a mirror base that looks adds some flair to any memorabilia showcase. What sort of items can be stored in these full view cabinets? They can hold jewelry of all sorts, from antique estate pieces to more modern goods crafted by a local artisan. 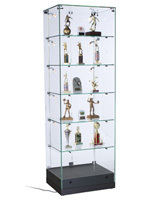 A meeting hall of a local baseball league team could use this as a trophy cabinet to show off their accolades, plaques, and team pictures. These shelving units could also be used by schools for the same purpose. Museums and galleries could use these fixtures to hold priceless and delicate pieces of sculpted artwork or other artifacts such as glassware or pottery. Curios will be protected from outside elements and kept safe from theft at the same time. 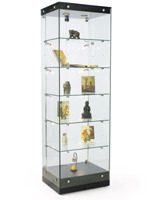 These showcases can be used as media centers, storing and showing DVDs, CDs, or books. Other collectible items like model cars, toys and antiques could be displayed in these as well. All of these cases are made with tempered glass, which is known to be stronger and sturdier than standard plate glass. Each base (and canopy, depending on the model) is crafted from sturdy MDF - medium density fiberboard - and covered in a laminate to provide a stylish finish. The laminate comes in four colors (not all colors are available for every unit): oak, rosewood, maple, black, wenge, cherry, and silver. In addition, all cases are protected with a longstanding lock with two included keys.